Happy Friday the 13th… I know it doesn’t mean anything, nor do I find the combination of a random day of the week paired with an equally as random number scary. What is however a tad scary, is that I entered into a 30-day video challenge. My challengers and I are all producing a video a (business) day for the month of October and posting daily to our YouTube channels. So that’s 22 videos in 30 days. Plans to re-invent the wheel (i.e. the video style) every week NOT going to happen if the task is 22 videos in 30 days and not winning a beauty contest. 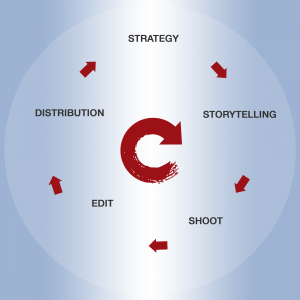 Here a link to video #8: Storytelling, Finding Content. Find out how super easy it is to get to content consistently! And, since you’re at it, please subscribe to my YouTube Channel! I have another challenge going with my nephew as to who will have more subscribers by the end of the year. And although, currently ahead of the curve, I don’t trust those digital natives. One viral video and I’m toast! All videos are shot on my iPhone 7 with a Sennheiser clip-on microphone, edited on Adobe Premiere. The graphics are produced in Adobe Photoshop and then imported into Premiere. As you can see, these five steps did not include strategy, distribution, or analytics! The above categories were what I knew as a filmmaker. I have come to realize, that what I knew about back then was video PRODUCTION, not video MARKETING. The moment we talk about video marketing, versus video production, we also need to talk about strategy, distribution, and analytics. 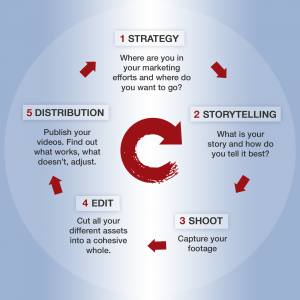 Video marketing strategy really starts with the end of the video marketing cycle: Figuring out where you will distribute your videos. If your videos live in Social Media that strategy might change rapidly as social media usage, rules, and are constantly in flux. To learn about the current top trends and tips, view the video below. With personal devices and social media platforms prominent in our daily lives, video is fast becoming one of the most powerful marketing tools for any size business. Still unsure if video marketing is right for your business? Or not sure you’re achieving your video marketing potential? We’ve curated these great links to give you a little insight into why and how video can be your company’s best friend; especially when it comes to branding, social media, and engagement. The proof is in the pudding! Check out this fantastic infographic by Vidyard, 10 Amazing Facts That Will Turn You Into A Video Marketing Advocate, full of statistics like: “Adding videos to your site increases your chances of a front-page Google result by 50x”. It’s true: Internet giant Google loves video marketing. So much so that they partnered with different brands in their “Unskippable Lab” series to figure out how ad length, storytelling style, and brand placement affected engagement and conversion metrics. Find out their results and more in What We Learned From a Year of Experimenting With Digital Video Adds. And make sure to check out the related story on how the same video plays differently on TV, Desktop, and Mobile In Video Advertising, is Longer Stronger? I love this blog post from Wistia mostly because they and I see totally eye to eye [it rhymes even] when it comes to video marketing strategies and video production. How To Add Video into Your Content Strategy really drives the message home, gives solid and approachable advice and it backs me up! There are many different ways you can use video to promote your business, from introductions and creation stories to product demonstrations and client testimonials. 10 Ways Small Businesses Should Be Using Video (with Examples!) will give you a brief explanation of how each video type can help your business with some fun and useful examples. Vimeo focuses on general marketing terminology that translates into video marketing in The terms you need to know when making a business video, so you can talk the talk (especially if you’re outsourcing). And if you want even more lingo check out our Definition Days. I love their video samples. Ready to dive into Video Marketing? 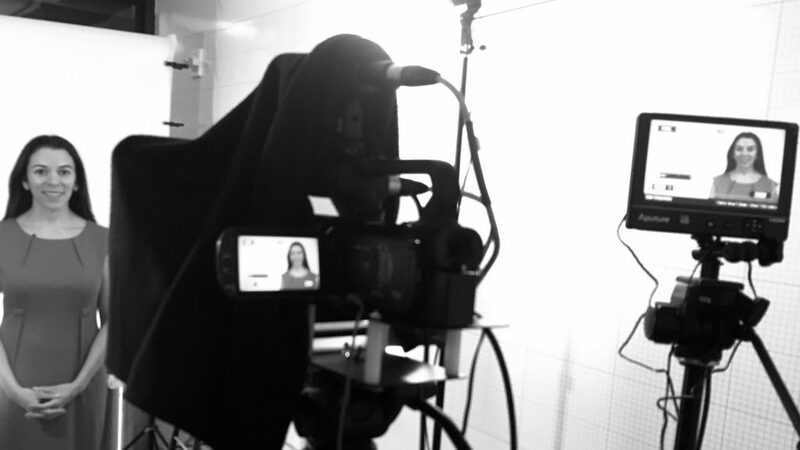 Let us get you on the right track with our comprehensive Video Assessment service. Scheduling for video marketing is equally as fraught with variables as budgeting for it, and the two really go hand in hand. Even if you are taking the do-it-yourself approach and plan on doing everything yourself, be realistic with what goes into the production process. Count YOUR time and brainpower into the budget! Budgeting is a very straightforward process and if you are a small business owner or solopreneur, you are probably very familiar with it for your business. 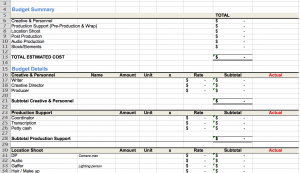 What’s new in budgeting for video, is some of the language and the anatomy of the budget. And even if you don’t budget yourself for video marketing it’s important to know what you are looking at. Most people don’t like to talk about money, but budgets are an essential part of any video production and budgets come into play right after an idea has hatched. Video is not a solitary craft or art form, it’s a team sport. How often have I wished I was a writer, or a painter, or anything else but a filmmaker; how much easier would it be to get financing and create without the worry of money. But let’s face it: the power of video lies in its capability to engage all the senses, both actively and subconsciously and for that it takes great ideas, technology, time, craftspeople, artists, and project management.